Spring Semester Begins January 5th, 2019 - Register Now! Music provides children a stimulating outlet with which to express themselves. The Gifted Music School environment provides social interaction, focus, and exceptional education for their maturing lives. Whether your child is just beginning or an advanced musician, our exceptional artists and educators will focus on each child's strengths to help them succeed. Choose from private lessons, group classes, or performance-based ensembles. For help choosing the right class for you, contact Susan Andersen, Student Services Manager, at sandersen@giftedmusicschool.org ! This class sets children up for a lifetime of musical success - Highly Recommended prior to starting an instrument, OR concurrent with private lessons. Interactive, aural-based, and fun, this class lays a concrete foundation for functional skills in ear training, solfege, applied keyboard skills, and more. 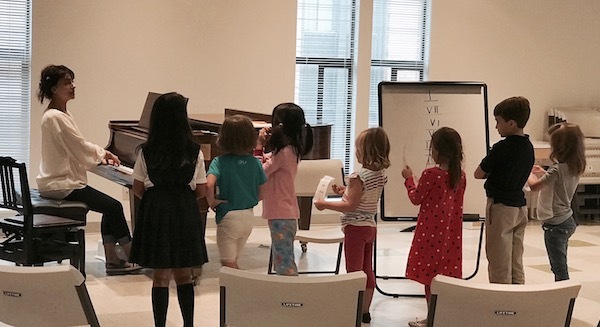 Taught by GMS founder, Dr. Vera Oussetskaia Watanabe, this special class is modeled after the beginning music class taught in the legendary Russian Gifted Music Schools. Students and parents agree -- Don't Skip It! Register now. The ideal first music class for very young children! Give your child a proven head start! Weekly, interactive music classes designed to benefit the very youngest child accompanied by a parent / caregiver. In a nurturing, positive environment, students gain behavioral, social, language, and math skills while participating in musical activities, songs and rhymes. Learn more. A weekly group class designed for future violin, viola and cello players (with parent)! Enroll during the semester prior to beginning private, instrumental Suzuki lessons. Students will be introduced to musical concepts and the early Suzuki strings repertoire through songs, games and activities. In addition, vital information on the Suzuki method of music education and home practicing will be provided to parents. Register now. Music learning for inspiration, fun, and education! A great introduction to music, these classes are excellent preparation for study on any instrument. Led by a Kodaly-certified, experienced early childhood specialist. Learn more. In a hands-on approach to music theory, children will explore musical concepts such as meter, tempo, phrase, form and dynamics through rhythm games, creative movement, songs, stories, ear training, sight-singing and improvisation. This class is an ideal complement to instrumental lessons, or a great preparation for studying an instrument. Children should wear comfortably-fitting clothes, no dresses, and be prepared to remove their shoes and socks. Register now. Gifted Music School is excited to announce a new traveling violin performing group, Vivace! To audition for this group the student needs to be at or above a Suzuki Book 6 level. Vivace will perform a wide range of music to appeal to diverse audiences. Classical, fiddling, sacred and popular music will comprise the repertoire. Learn more.